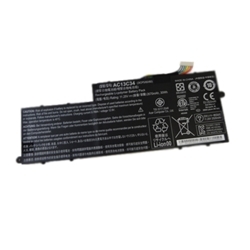 Description: New genuine Acer Aspire laptop battery. 11.25V, 2670mAh, 30Wh, 3 Cell. Compatible Part #'s: AC13C34, KT.00303.010, KT.00303.005, 3ICP5/60/80. Acer Aspire E3-111, E3-112, E3-112M, ES1-111, ES1-111M, V5-122, V5-122P, V5-132, V5-132P.